How do I set up DKIM for Postmark? Adding DKIM authentication to emails you send through Postmark requires that you add a DKIM record to your DNS. Once DKIM is set up and verified, emails sent through Postmark using the domain will be signed with DKIM. Navigate to your Sender Signatures tab. Under the domain you are adding DKIM authentication for, click DNS Settings or Add a DKIM DNS record. 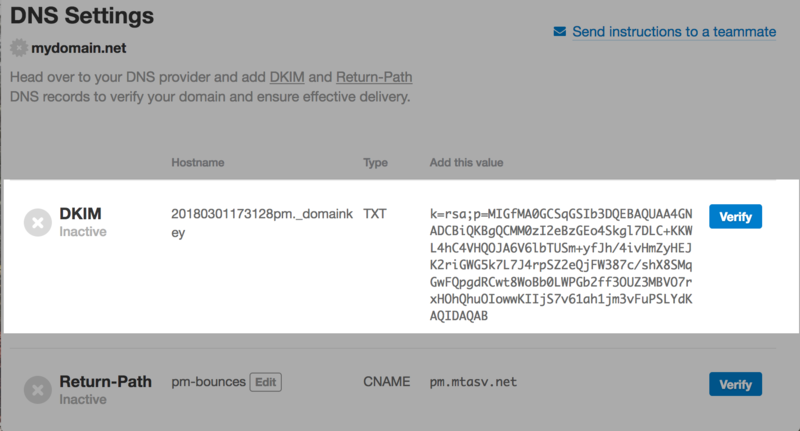 A DKIM record will be shown that needs to be added to your DNS as a TXT record. Head over to your host or DNS provider and access the area where you can add new DNS records. For some help on where you can do this for common DNS providers, see our resources for adding DNS records for some common providers. In your DNS manager, add a new TXT record with the Hostname and Value shown in your DNS Settings page for the domain you adding DKIM for. Once the record is added to your DNS, DKIM will show as verified in your Postmark account within 48 hours. You can use the Verify button to initiate a manual verification check if you do not see the record automatically become verified. After the DKIM record is verified, we will begin signing emails sent through Postmark using this domain with DKIM. The entire domain will also become verified for sending, meaning you can send from any email address on the domain without needing to add it as a Sender Signature first.